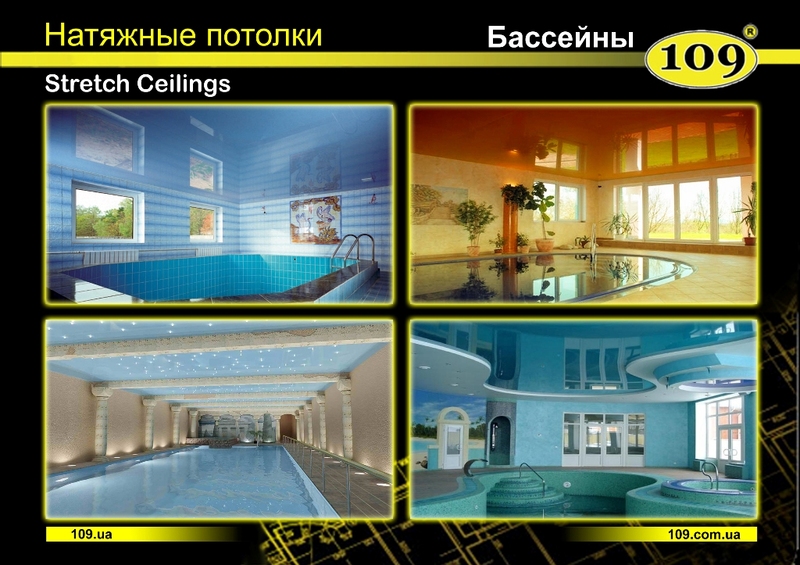 A stretch ceiling is a product about which we are going to tell you on this website. Here you can find our prices, obtain information about the installation of stretch ceilings, and also you can see photos of our works. 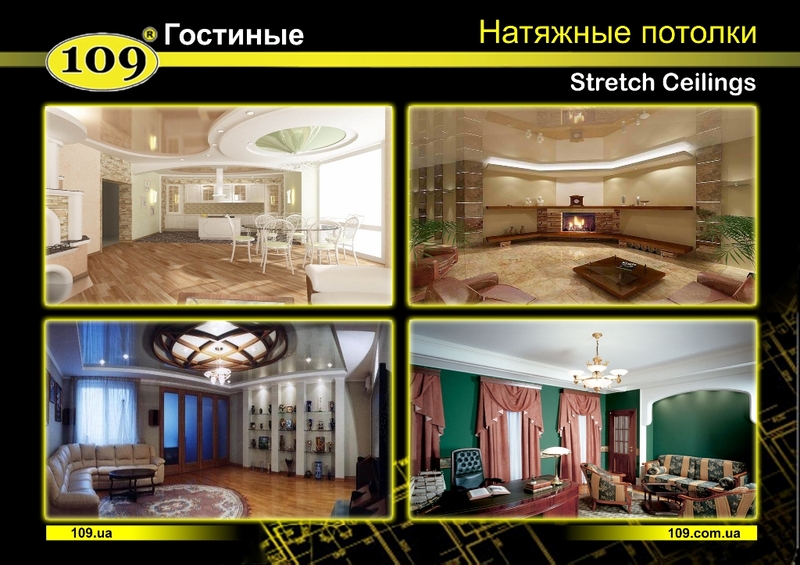 Stretch ceilings of the Kiev company One hundred nine represent a European quality for the Ukrainian hryvnia (a national currency of Ukraine). A stretch ceiling gradually moves from the class of luxury good to the class of necessary good on the Ukrainian market. 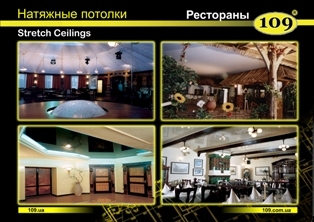 Our company is located in Kiev and makes installation of stretch ceilings throughout Ukraine. We are a manufacturer of stretch ceilings and we are constantly expanding our dealership network in Ukraine and abroad. 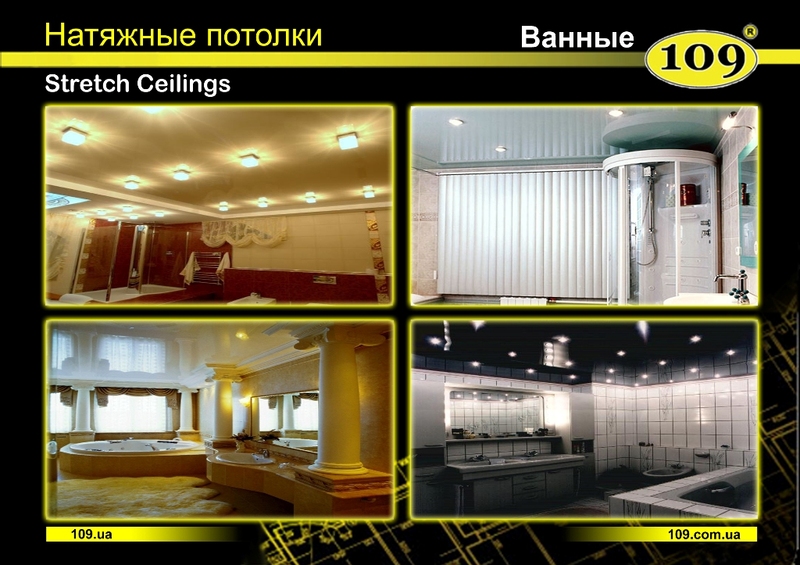 The aim of the company One Hundred Nine is to provide modern and sophisticated finishing materials, offering stretch ceiling systems on the Ukrainian construction market. Kiev trade mark One Hundred Nine is the best balance between the value for money. The company has high-educated technologists and specialists, who are ready to resolve any task for our clients. One Hundred Nine constantly expands its dealership network in Ukraine. You can find video tutorials on installation of stretch ceiling on our website, under the head "Video". Thanks to the efficient work organization and improved technology, stretch ceilings orders are performed in the shortest time span - from 3 to 10 days. A well-balanced pricing policy makes the European quality more accessible for Ukrainian consumers. 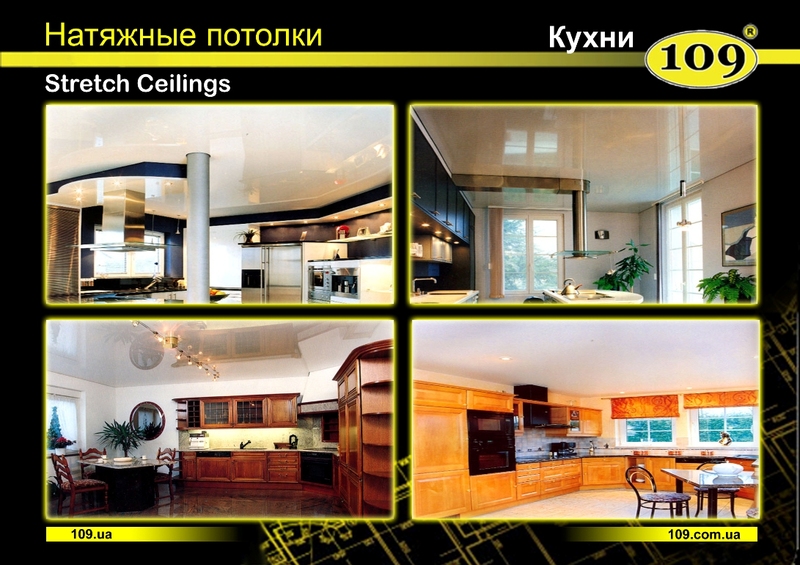 The Kiev company One Hundred Nine is ready to cooperate and invites architects and designers to jointly implement challenging and high-tech interior designs projects using stretch ceilings. We hope that our service will not disappoint you and you will become our constant client! The ceiling is the only place in our homes or apartments, which was not touched by the architect for a long time. It is white, flat or curved. However, this "white sheet" is ready to express the individuality of the owner. Nowadays the most popular ceilings are French stretch ceilings. The history of appearance of stretch ceilings dates back to the ancient times. Their traces are found on the territories of ancient states, such as Egypt, Greece, Rome. The modern version of stretch ceilings appeared in the mid-60s in Sweden and immediately became popular in Western Europe. 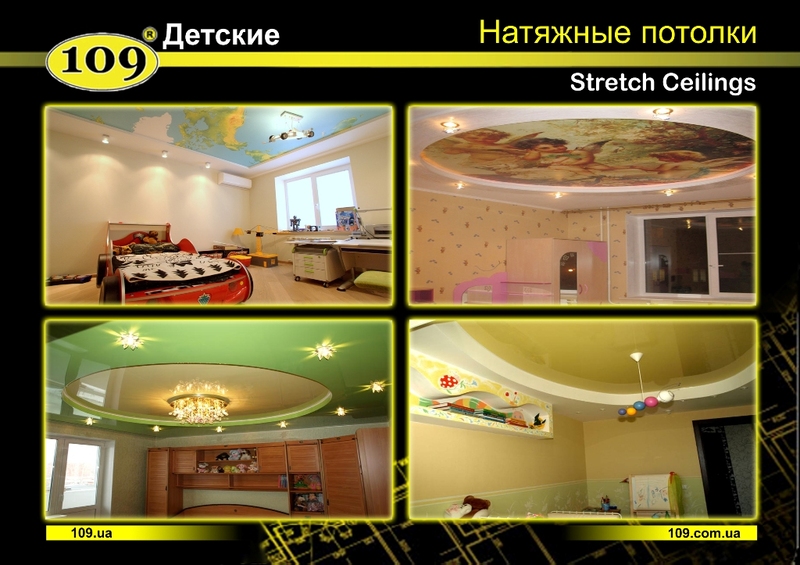 In Ukraine stretch ceiling became popular not so long ago. However, its undeniable advantages, aesthetics, a wide range of colors that allows to implement the most extraordinary designer’s fantasies together with its practicality and moisture resistance make this product far more popular. Our fabric material is a thick PVC based fully recyclable stretch membrane that corresponds to all health and safety requirements. French stretch ceiling is the fastest way of finishing. It does not require pre-finishing, can hide any defects of the ceiling, can renew and refresh the whole interior of the apartment, home, office. 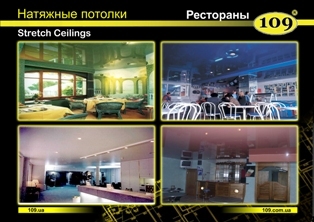 French stretch ceilings are suitable to be installed in houses, offices, banks, hotels, restaurants, shops. The material comes in a vast array of colors and finishes, providing our artists and designers with an unlimited and endless possibility to create an individual and unique design for you. Compared with traditional technologies of finishing ceilings, that require to be renewed every 3-5 years, especially in kitchens and bathrooms, French stretch ceilings do not require special maintenance. The material will not crack or fake and stays clean for a long time. If it is necessary you can just wipe it. Stretch ceilings are made of a thin durable vinyl film fixed to an aluminum or plastic profile. Each ceiling is made individually. That’s why before we start our work we take measurements of the ceiling at your facility. The process of installation of stretch ceilings. At first, place your order at our office. Then our technicians will take measurements of the exact shape of the ceiling to be fitted. After that, the received measurements are transmitted and your ceiling is traced in our technical office. The ceiling is custom made to the exact measurements in our factory. Then a harpoon is fixed to the perimeter of the walls. A harpoon is an yielding plastic that serves as a fixing system for a stretch ceiling. Your stretch ceiling is stretched and installed. The membrane of the stretch ceiling can be matt or lacquer and of different colors and tints. We offer a wide range of colors and finishes: silk, satin, matt, translucent, lacquer, nacre, metallic, perforated and hygienic. 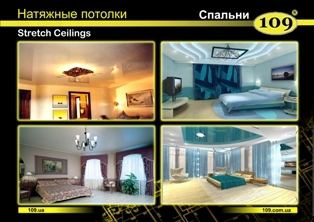 Our company offers more than 160 colors for stretch ceilings. Gloss stretch ceilings. Dark membranes create an effect of the second floor, a kind of a hole on the ceiling. The gloss ceiling looks better in combination with plasterboard. We offer a wide range of colors (over 200 colors and tints). So you can have a 3-D ceiling at your place. Matt stretch ceilings (both colored and white) are available in two categories: smooth or finished. Smooth ceilings create a small reflection on the ceiling, the so-called "satin sheen". Finished ceilings create an impression of "irregularity". Visually it looks like an ordinary plasterboard ceiling, but perfectly smooth. It makes an impression that there is a fabric on the ceiling. This stretch ceiling is ideal for domestic premises. Metallic stretch ceiling is something between lacquer and satin stretch ceiling. Its color is intense. It is very thick and heavy. Without lighting, the ceiling looks like lacquered but with a bad reflection. The grain effect can be obtained by adding some light. Metallic texture can "absorb" the light and can change the color of the light. That’s why it is one of the most expensive material. Perforated stretch ceilings may be of any texture and color. It is evenly placed over the entire area of a stretch ceiling with a certain hole of a given diameter. There are about 5 types of perforations (it depends on the company). A stretch ceiling with a photo printing is a white or beige matt ceiling with a photo printing on it. Nowadays it is fashionable to make an image or a photo on a ceiling. Photo printing can be matt, satin or glossy. You can make a photo printing of clouds, of the sky, of clouds and stars, of the night city on the ceiling. A stretch ceiling with an artistic pattern is a white or beige matt ceiling. 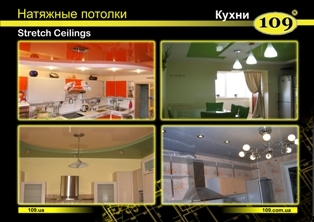 Our specialist will draw a picture on the finished ceiling. It is expensive, but it’s exclusive. Stretch ceilings can be inclined or can have a curved surface that can visually widen the space or modify it with the help of color, reflection and shape. The specificity of the material allows us to create different surfaces and geometric shapes of the ceiling: oval, wavy, of different levels, rounded, dome-shaped, three-dimensional, zigzag etc. If hygiene is a priority, you can clean the ceiling by using a vapor of chlorine solution or under pressure. You can also see the photos of our works on our website.